You back your Corvette out of the garage and there they are…two or three red drops in the area of the power steering components. You hope it will cure itself, but it doesn’t. Soon, the drops are puddles. Are the leaks coming from the hoses, pump, control valve or control cylinder? You finally decide to check it over and find that it is leaking a little at all of the power steering components: the pump, control valve, control cylinder and hoses. You could just replace each component, but more than likely, a rebuild will cure the problem. It does not take a rocket scientist to rebuild the Corvette power steering components. All you need is good mechanical ability, normal hand tools, some spare time and the right parts. Most Corvette owners can supply the time, tools and ability and Zip Corvette Parts, 8067 Fast Lane, Mechanicsville, VA 23111, 1-800-962-9632. , can supply all of the needed parts. Whenever you are going to rebuild any of the power steering components, remember to take your time and follow all of the directions. By doing so, you will minimize the chance of damaging something or having to go back and do a repair over. We are going to rebuild the pump control valve and control cylinder in our 73 Corvette. This way, you will be able to see how each one is done. As with any rebuild, you have to start with a good core. If the shaft in the control cylinder is pitted or bent, you will not be able to rebuild it. If the control valve housing is cracked or the power steering pump shaft is bent or worn, you will not be able to rebuild these. During the dis-assembly of each component, check every part that you will have to re-use carefully. Any damaged part will have to be replaced or the rebuild will not be successful. Now let’s get started and stop those drips. 01: Here are all of the rebuild kits and hoses supplied by Zip Corvette Parts. New power steering hoses, a control cylinder kit, power steering pump kit and a control valve kit. You will also need normal hand tools, a vise, some type of parts cleaning solvent and a shop manual for your year Corvette which is also available from Zip. 02: To remove the control cylinder and the control valve, you will need a Pitman Arm or ball joint removal tool, such as this. Its other name is a Pickle Fork! 03: Start the rebuilding of each component by thoroughly cleaning it in a non-toxic solvent parts wash.
04: Control Valve: To remove the control valve from the car, raise the front of the vehicle off the ground and place it securely on jack stands. Remove the relay rod to control valve clamp bolt. Disconnect the power steering hoses and let them drain into a catch pan. Remove the control valve ball stud to Pitman Arm nut and use the pickle fork tool to release the ball stud from the Pitman Arm. Turn the Pitman Arm to the right clear of the control valve and unscrew the control valve from the drag link. Now place the control valve into a vise and carefully remove the dust cover. 05: With a socket and ratchet, remove the adjusting nut. I always like to count the number of turns it takes to remove the nut. This way I have some idea where it should be when it comes time for reassembly. 06: The valve to adapter bolts can now be removed. This will allow you to remove the valve housing and spool. 07: Now carefully remove the spool from the housing. 08: Next you remove the spring, o-ring, valve reaction spool, spring thrust washer, valve spring, spring retainer, annulus seal, annulus spacer gasket and valve shaft washer from the adapter. It is a good idea to place them on a clean paper towel in the order that they were removed. This way there is less of a chance for a mistake when reassembly is started and you will also be able to see exactly what parts you are replacing. 09: Carefully turn the adjuster plug out of the adapter sleeve. It is very important that you do not knick the top surface. 10: Turn the adapter upside down. This will allow the spring and one of the two ball seats to fall out into your hand. 11: Now remove the ball stud, the other ball seat and the ball stud boot. With these removed, the sleeve will slide out of the adapter. Wash all of the removed parts in a non-toxic solvent and thoroughly dry. Now carefully inspect all parts for damage such as scratches, burrs, distortion or excessive wear. Replace any damaged parts now before reassembly. If you find any parts that need to be replaced, contact Zip Corvette Parts. They will be able to help. 12: With your inspection done and all of the parts cleaned, you are ready to begin reassembly. Start by replacing the sleeve and the ball seat into the adapter. Now install the ball stud and the other ball stud seat. The ball seat spring is next (small coil down). Put the adapter into a vise and place the shaft through the seat in the adjuster plug. Screw the adjuster plug into the sleeve. Turn the plug until tight, then back off until the slot lines line up with the notches in the sleeve. 13: Insert the plug to sleeve key. Be sure the small tangs on the end of the key fit into the notches in the sleeve. 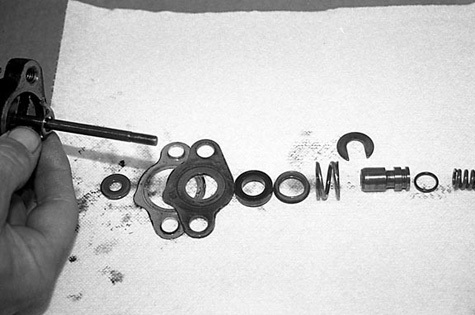 14: Install the valve shaft washer, gasket, annulus spacer, the reaction (annulus) seal (lip up), spring retainer, reaction spring (valve spring), valve reaction spool, spring thrust washer, and valve adjustment spring. Be sure to install the o-ring seal on the spool before installing the spool on the shaft. Also, install the washer with the chamfer up. 15: Now install the Vee Block seal onto the valve spool lip down. 16: Carefully install the spool into the housing. DO NOT jam the spool into the housing. 17: Place the housing and spool onto the adapter. The side ports should be on the same side as the ball stud. Bolt the housing to the adapter. Depress the valve spool, install the adjusting lock nut onto the shaft, and turn it onto the shaft the number of turns that it took to take it off originally. If you do not remember, start with four turns. 18: Now tape off all of the steering hose ports and ball stud and refinish the whole valve in Eastwood’s Under Hood Black. This will give it a brand new look. 19: Install the ball stud boot and re-install the dust cover, but do not tap it down fully. Once installed on the car, you may have to remove it to adjust the valve. Install the control valve onto the drag link so that the control valve bottoms. Then back off enough (if necessary) to install the clamping bolt. Tighten the control valve clamping bolt and assemble the ball stud to the Pitman Arm. Torque to specs. Fill and bleed the system. Then balance the valve. CONTROL CYLINDER: To remove the piston rod seal, start by removing the snap ring. Then pull out the rod until it stops. 21: Now remove the backup lock nut, backup washer, piston rod scraper and piston rod seal. 22: Before you start to re-assemble the cylinder, check for damage to the rod. Look for gouges, pits or deep scratches. These can all damage a new seal. If they will catch on your fingernail, they are probably too deep and they will damage the seal which will cause a leak. If damage is this severe, a new cylinder is in order. Start your reassembly by installing the piston rod seal and washer first. 23: The piston rod scraper is now installed and the snap ring to hold everything into place. 24: To remove the ball stud, depress the end cap and remove the snap ring. Push on the end of the ball stud to remove the end plug, spring, spring seat and ball stud. Reach inside the ball stud area and remove the o-ring. 25: With the ball stud out, check for any damage. Look for worn spots on the ball or distortion. If any damage is present, replace the ball stud. Zip Corvette can help you with this. Now start the reassembly. Carefully install the o-ring in the groove. 26: Now replace the ball stud, spring seat, spring (with small coil end facing out) end plug and snap ring. Be sure the snap ring is properly seated. 27: You can refinish the cylinder by taping off the shaft, ball stud and hose openings and spraying it with Eastwood’s Under Hood Black. 28: After it is dry, slide on the ball stud boot, install the grease fitting in the end cap, and fill it with grease. It is now ready to be installed onto the Corvette. 29: POWER STEERING PUMP: To rebuild the pump start by cleaning it in a non-toxic solvent. It is much easier to work on a clean part than a greasy one. Mount the pump in a vise. Be careful not to distort the front hub of the pump. Use a 7/8 and 15/16 wrench to remove the pulley retaining nut. 30: Use a pulley remover to remove the pulley. (These can be rented from most tool rental shops) Also, remove or keep track of the alignment key. 31: Now remove the union and seal. 32: Remove the reservoir retaining studs. Keep track of which stud went where. 33: The reservoir can now be separated from the housing. 34: The mounting bolt o-rings and the union o-rings can now be removed. 35: Remove the end plate retaining ring by compressing the retaining ring and prying it out with a screwdriver. You can compress the retaining ring by inserting a small punch in the 1/8″ diameter hole in the housing and pushing it in until the ring clears the groove. Now a screwdriver can be installed and the ring worked out. The end plate can now be removed. This plate is spring loaded and should rise above the housing level. If it is stuck inside, a gentle tap should free the plate. 36: Remove the shaft woodruff key and tap the end of the shaft with a dead blow hammer to free the pressure plate, pump ring, rotor assembly and thrust plate. Remove these parts as one unit. 37: Now remove the end plate o-ring. Check the shaft for wear. Look into the housing for scour marks. Check housing and reservoir for cracks. Make sure all parts are clean for reassembly. 38: To remove the old shaft seal, insert a wide blade screwdriver into the seal and gently pry it out of the housing. 39: Install a new shaft seal. Use a seal installer or socket and hammer to seat it into the housing. Now re-install the pressure plate, pump ring, rotor assembly and thrust plate. 40: Lubricate the outside diameter and chamfer of the pressure plate with petroleum jelly (Vaseline) so as not to damage the new o-ring. 41: Place the plate on the dowel pins with the ported face toward the pump ring. Seat the pressure plate by placing a large socket on top of the plate and pushing down with your hand. 42: The end plate spring, new o-ring and end plate can be installed next. Be sure to lubricate the end plate o-ring with petroleum jelly to stop damage. Re-install the end plate retaining ring. (This sometimes will take two people. ) Be sure the ring is in the groove and the ring gap is positioned properly. Also install the new mounting bolt o-rings and the new union o-ring. 43: Now install the flow control spring and plunger with the hex head screw end in the bore first. 44: Place the reservoir in its normal position and press it down until the reservoir seats on the housing. Check the position of the stud seals and the union seal. Re-install the reservoir retaining studs. Place a new o-ring on the union and re-install it. 45: The woodruff key can now be re-installed. 46: Slide the pulley into place and re-install the retaining nut. When the pump is re-installed on the car, it will have to be bled. To do this, first connect all of the hose fittings. Now fill the reservoir. Bleed the pump by turning the pulley backwards (Counterclockwise as viewed from the front of the car. ) until all of the air bubbles disappear. If the system has been drained, you will have to keep refilling the reservoir as it fills the system. When the system is bled, install the belt and tighten to specs. 47: It is very important that the power steering hoses are routed properly. Hoses installed out of position can cause pressure losses and increases and they can also be subject to chafing and other abuses during turns. Always make hose installation with the front wheels pointed straight ahead. Never twist hoses to make them fit. Here is the proper routing for the mid-seventies Corvettes. 48: This is our power steering system completely rebuilt and ready to install. Ready to run and no more drips.